A stormy start to the day in the West as we passed through Tongue, a very impressionable region called Moine and a then brightening sky as we skirted Thurso, Scrabster and Dunnet Head. Somehow this picture seemed to capture our NC 500 journey. The road and scenery so close to each other - long empty roads that are easy to manoeuvre if you are patient. A squally storm blew up as the wind strengthened and we captured this deserted farmhouse in such a dramatic setting and stormy weather. Very much Clan Mackay country and Varrich Castle is just east of Tongue. Apparently they were one of the few clans that never fell to the Romans. Birds of prey circled near the castle as we stopped for some lunch. Just before John O'Groats - heading East is the former Queen Mothers home. Our guide, Mark imparted us with so much interesting background information. We'd recommend the leek and potato soup in the visitor centre! 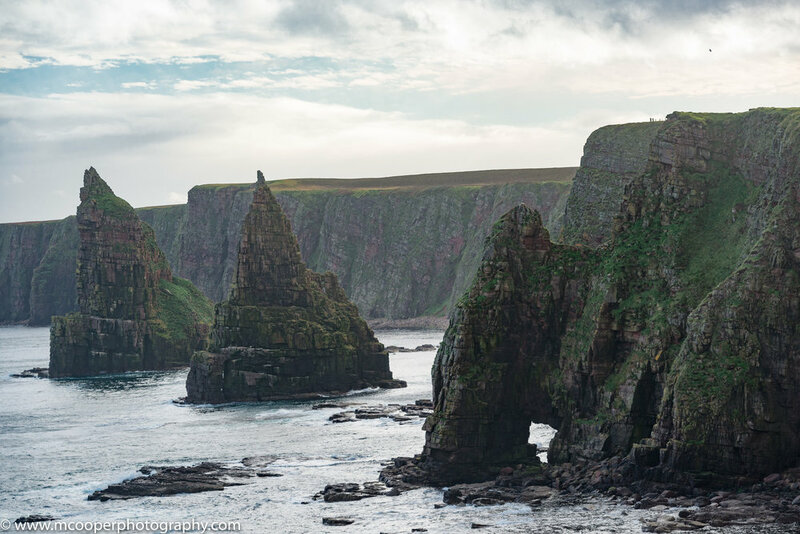 Duncansby Head is actually the real 'most northerly' point by over a mile. Whilst John O'Groats is an increasingly popular commercial tourist attraction Duncansby Head has retained its unspoilt natural surroundings.